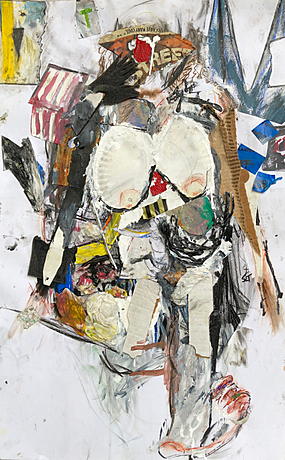 Figuring (a mess too), Found objects and acrylic on paper, 35 x 22.5"
I find objects and objects find me. There are so many things out there, left behind & thrown away, their weight and heft slowly growing ripe. At a point, these become like bright ghosts in the night, standing out from their surroundings. They follow me home to be sorted and sifted, matched and melded. Flung and delicately placed. To be guided into a thigh, a finger, the curve of an ear or the hollow of a hip. Into something, anything, other than individual objects in the world, lost to disintegration. I move objects; objects move me.